Melanie believes that life is all about balance. Work hard during the day and unwind at night. Eat chocolate chip pancakes when your heart wants it and drink green juice when your body needs it. Live and love. Move and stay still. Aim for balance. Melanie’s Medleys makes deliciously fresh, wholesome foods that artfully balance indulgence, wellbeing and great taste! Melanie is seriously passionate about food and believes that food is as much about adventure as it is an expression of love. 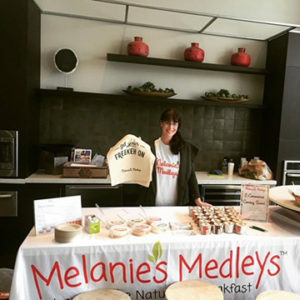 She created Melanie’s Medleys to share her passion of food with others and to make it easy to eat well. Melanie’s Medleys is going beyond the bagel with our deliciously handcrafted cream cheese spreads. With so many flavors to choose from, the possibilities are endless!